The thing I love most about my barn is the stalls I chose. It brings freedom and comfort to the horses in allowing them to feel as if they are out in the open. It also allows them to be social with the other horses. I can see the difference in the horses! I absolutely love the stall fronts! I never thought I would have such beautiful stalls in MY barn. My builder was really impressed, as well. Please thank the entire Lucas team for coming through for us. We hope you will consider us a reference for any customers looking for an example of your fine work. From our very first inquiry about Lucas Equine, through the painstaking process of deciding which of your beautiful styles was the best choice for us, to the details of exact measurement of our barn itself, we have been extremely impressed. We expected a fine product, but the stall fronts and doors delivered to us exceed our greatest expectations. The attention to detail extends all the way to the careful and protective way in which they were delivered. Thank you so much for the BEAUTIFUL stall doors you created for me!! They are gorgeous! Thank you for making my dream barn come true. I'm very happy that I went with the crosshatch design from Lucas Equine. I think it looks nicer, and it’s safer for the horses. If anyone wants the best stalls ever, they’ve got to visit Cynthiana, Kentucky! I’m glad I chose y’all’s stall doors and grills! They are gorgeous and functional. I think my horses are proud of the barn, too. Thank you for the best stall doors ever. I’ve been working with Lucas Equine for over twenty years...doesn’t that say something about your products AND service? Your company is excellent. I would never consider using any other brand or product in my barn. As founder and senior principal of Blackburn Architects, I have worked with Lucas Equine for 30 years, from our first horse farm (Heronwood Farm) in 1983 to our most recent (Pegaso Farm in Mettawa, Illinois) completed in 2013. It is difficult to count them all, but we have probably built barns for well over a hundred horse farms, and I would guess Lucas Equine has furnished the stall systems for virtually every one of them. 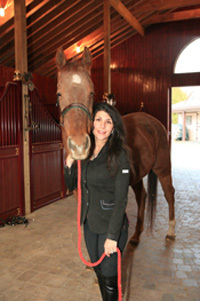 I recommend Lucas Equine to all my horse farm clients. I have said many times, “a healthy barn should not have to cost you an arm and a leg, but neither should a poor barn design cost you your horse.” I can say the same thing about the selection of your equine equipment. Lucas Equine has a great product and backs it up with equally great service. They are not the lowest cost stall equipment around, but I have found them to be the best value by far for the cost. They know what they are doing, stand behind their product, and continue to do so years after it has been in use. I have a great working relationship with Lucas Equine and their entire staff. We installed Lucas Equine stalls and screens at all our stables, and everything they have delivered us has been top quality. There is not anyone else I’d even consider using to supply my stable equipment. Lucas Equine stalls represent the best quality and workmanship you’re going to find anywhere. I consistently work with Lucas Equine because they care about the details, and they back up their products. 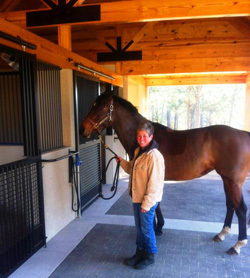 Jack Hart, Advanced Equine Construction, Inc. I could not have asked for better service or better quality. I would recommend you guys to anyone. Lucas Equine products are completely designed and built in our Cynthiana, Kentucky, USA facility. Our products are installed in barns across North America and the world. Contact us at 888-577-6920 for references in your area.